OptioNow was founded by a group of capital market dealers with dozens of years expertise in both online and offline trading. We founded OptioNow to offer the excitement and profit making potential of binary options trading in an easy to use, top quality platform. Our primary focus has been and will continue to be honesty, integrity and professionalism. In order to provide the best possible Binary Options trading experience for online traders, OptioNow has set the highest attainable goals. Our vision is to be the world’s leading independent commercial binary options company. Our devoted qualified team is committed to the various needs of our clients, providing them with the highest quality and cost effective professional services. Our multi-lingual customer service division and dealing room is open 24 hours a day, 5 days a week. We nearly never close! So wherever you may be throughout the world, OptioNow is just a phone call away. 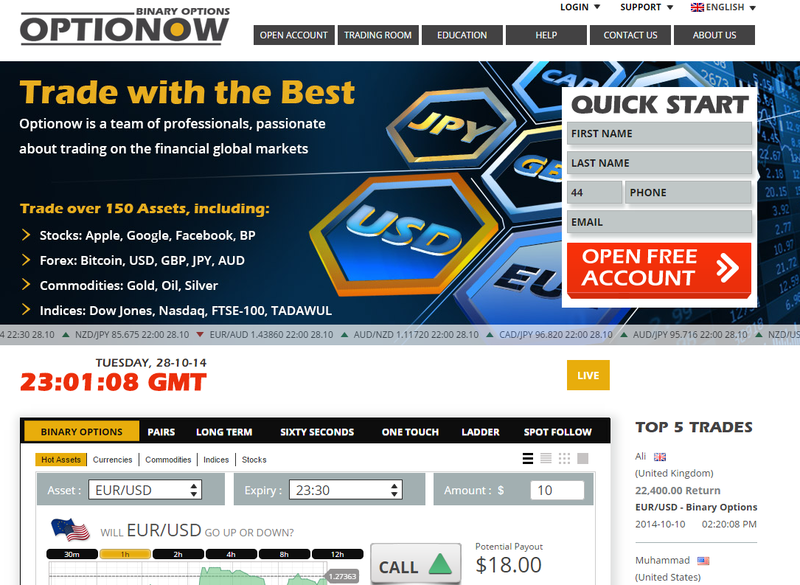 OptioNow remains ready and available to assist our customers. Our highly committed multi-lingual staff provides our clients with efficient, friendly and professional service. OptioNow brand is owned and operated by Zluti Marketing Limited, 201 Rogers Office Building, Edwin Wallace Rey Drive, George Hill, Anguilla.